Small Cottage House Plans . . . small in size -- BIG ON CHARM! The small cottage house plans featured here range in size from just over 500 square feet to nearly 1,500 square feet. Though small in size, they are very, very BIG on charm! Well-designed exteriors and efficiently arranged interiors with open floor plans make for a winning combination in these lovely little cottages! Large covered porches and open decks expand the living area and bring the outdoors in. The extensive use of natural materials such as stone and wood shingles lend authenticity -- and quality -- to the overall designs. At only 569 square feet, the vacation retreat pictured below is the smallest cottage featured here. Despite its small size, the open living area reflected in the floor plan below, right, gives it a more spacious look and feel. The full width front porch also adds to the feeling of openness in this small cottage house plan. A curved-shingle roof, massive stone chimney and shingled exterior add rustic charm to the compact 1,035 square foot Craftsman Style cottage pictured below. The exterior is further enhanced by the covered entryway, where delicate wood posts are anchored on enormous splayed stone bases. In the shed dormer, Arts and Crafts grills define the three large windows. Warmed by a large stone fireplace, the living room is complete with a window seat in the bay window. The adjacent dining room is separated from the country kitchen by a peninsula counter, as shown in the small cottage house plan below right. On the second floor, two bedrooms -- the larger one with a walk-in closet -- share a full bath. 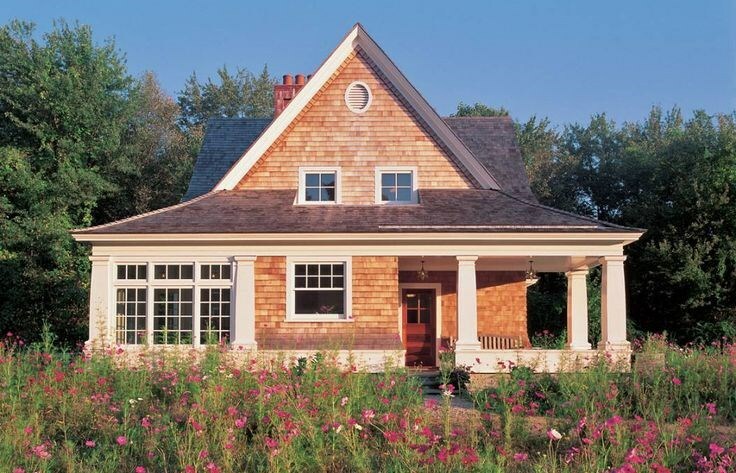 Inspired by 19th-century summer cottages along the East Coast, the 1,442 square foot Shingle Style design pictured below is suitable as either a year-round residence or a vacation retreat. Serving as outdoor entertainment areas are a wraparound veranda in front and a screened porch in back. Hardwood floors, along with nine and ten foot ceilings add beauty and volume to the indoor living spaces. The front door opens to a two-story foyer adjacent to the spacious and open living room. Nearby, the dining room is nestled between two sets of sliding French doors, one to the veranda and the other to the porch. Centrally located, the efficient kitchen features a convenient pass-through to the living room. Double doors open to the first floor master suite with its private bath and access to the porch. The master bath includes a handy pocket door to the utility room. Upstairs, two bedrooms, both with sloped ceilings, share a four-fixture bath. A built-in seat adds to the appeal of the balcony area. A steeply pitched roof, three pedimented dormers and a full-width porch supported by rugged posts help countrify the 1,065 square foot bucolic cottage pictured below. Batten-board shutters trim both the entryway and the first-floor windows, further enhancing the provincial flavor of the design. Inside, the compact floor plan is designed for maximum efficiency. The living room is a showpiece, its vaulted ceiling soaring a breathtaking twenty-six feet. Towering custom glass set atop casement windows flood the space with light while a hearth fireplace with an exposed flue warms the space. The corner kitchen is convenient to both the living room and the dining room. Its counters are stylishly angled, and a pass-thru makes meal service easy. A large utility room and the guest half bath complete the first floor. Upstairs, a nine-foot ceiling augments the spacious feeling of the master bedroom. Multiple dormers help illuminate the room as well as the large walk-in closet. The bathroom is shared with the sleeping loft that overlooks the living room. A wide welcoming porch supported by massive posts greets visitors to this cozy 910 square foot vacation retreat pictured below. Deep eave overhangs and scalloped shingles in the gable ends intensify the rustic character of the home, while multiple bay windows and a front door with oval glass add pleasing architectural accents to the design. The entry foyer insulates the living areas on the left side of the home from the sleeping quarter on the right. Vaulted ceilings are featured throughout the home. A bay window in the front-facing kitchen creates a cozy breakfast nook while helping to illuminate the space. There is also a pass-through to the living room which is dressed with a fireplace and sliding doors opening to the rear patio. Two spacious bedrooms share the full bath that divides them. The front-facing master bedroom is expanded further by a bay window, and both bedrooms have been provided with ample closet space. A spacious wrap-around porch and walk-thru great room make the 780 square foot, two story cottage pictured below feel much larger than its modest size would otherwise dictate. This little retreat also contains a fireplace and a cozy dining nook. Upstairs is a bedroom and a full bath, along with potential expansion space. A shed dormer and rustic exterior enhance the small cottage house plan of 1,053 square feet pictured at right and below. Both a covered porch and large open deck area warmed by an outside stone fireplace extend the living area to the outdoors. The living room/dining area has two bays and another fireplace, as well as access to the deck. The U-shaped kitchen features an eating bar, pantry closet and close proximity to a stacked washer/dryer for convenience. Two bedrooms share the hall bath with the master bedroom, which is warmed by a romantic fireplace. Upstairs, an additional 960 square feet in bonus space can be finished off to add extra bedrooms or a play room. Please check back often or subscribe to our RSS feed, as we frequently add new images of small cottage house plans to our site.